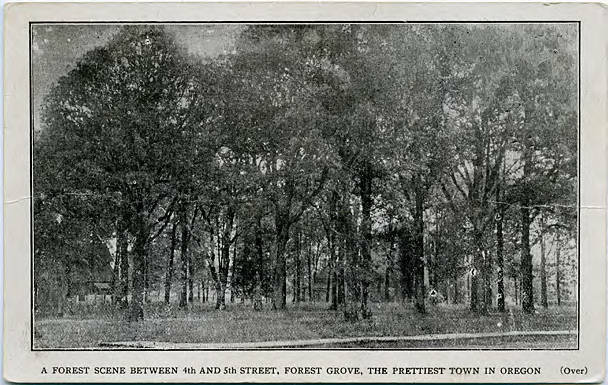 Black and white photograph of a forested block in the town of Forest Grove. A large house is barely visible behind the trees. Lettering on the bottom and back of the card brags about how Forest Grove is the 'prettiest town in Oregon,' an example of 'boosterism' and a common practice in the late 1800s and early 1900s, especially in smaller towns in the American West who were seeking immigrants to boost their populations and economies. 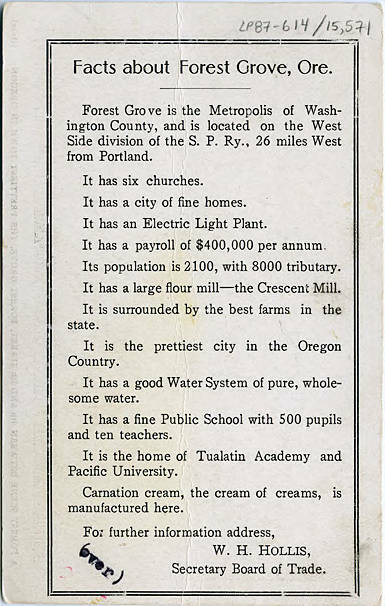 This particular card was published by the Forest Grove Board of Trade, founded in 1904 to promote the commercial interests of the community.